Toss boring fruit salad recipes aside and surprise them with this scrumptious Grilled Fruit Salad! 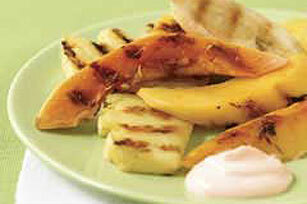 Papaya, banana, mango and pineapple meet a creamy sour cream mixture in this Grilled Fruit Salad recipe. Combine first 3 ingredients until well blended. Refrigerate until ready to use. Grill fruit 6 min. or until lightly browned on both sides, turning over after 3 min. Arrange fruit on platter. Serve immediately with sour cream mixture. Or, cover and refrigerate fruit platter and sour cream mixture separately until ready to serve. Spoon sour cream mixture over fruit just before serving. Allow 30 to 40 min. for the charcoal coals to be ready for outdoor grilling. The coals are ready when covered with a fine, gray ash. If the fire is too hot, use tongs to spread out the coals. Or, for a hotter fire push the coals closer together. For more color and flavor, add 1/4 cup each blueberries and raspberries to the grilled fruit platter before topping with sour cream mixture.